I was thrilled to see cookbook author Sheri Castle in town again the day after the launch of her Southern Living Community Cookbook. Her book signing and cooking demo took place at local farm-to-fork favorite Mary's Gourmet Diner. Created in the spirit of your spiral-bound church/fire department/PTO fundraiser cookbook, the beautifully illustrated and photographed Southern Living Community Cookbook is a curated selection of ALLLL the recipes submitted for consideration in the Southern Living Annual Recipe Cookbooks over the years. After reading more than 45,000 new and old recipes, Sheri explained that only 250 made the cut. As she writes in the cookbook's introduction, not only were these community cookbooks powerful fundraisers for good causes, they were also "love letters, gifts and mementos," but they "also serve as a documentary of American foodways .... and at their core, a form of folklore." While the recipes included in the cookbook are from kitchens from all over the South, I was happy to see many North Carolina dishes from the Piedmont Triad. (Not surprisingly, we showed strong in the dessert chapter.) 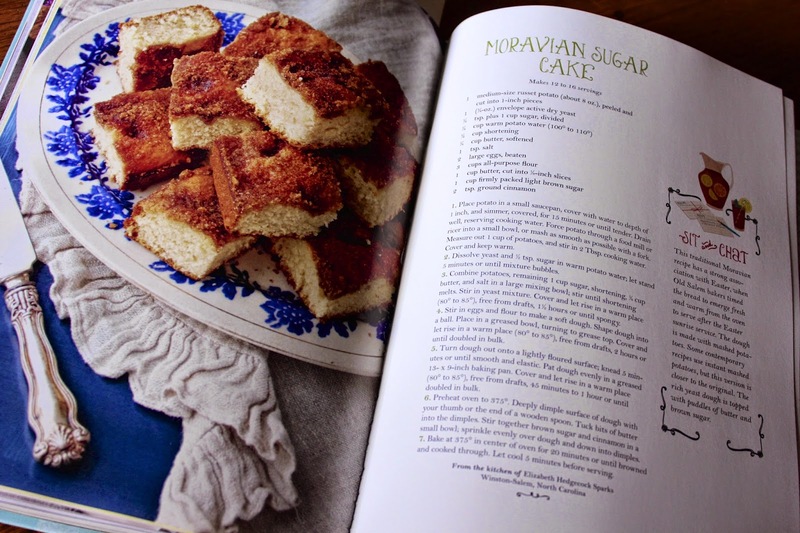 Winston-Salem favorite Moravian Sugar Cake made the cut (recipe below). 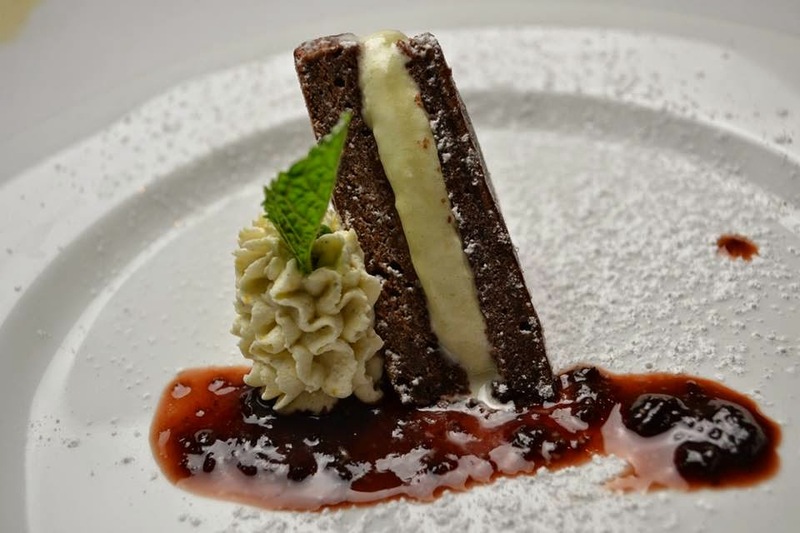 Other local favorites include a recipe by beloved former Winston-Salem Journal food editor Beth Tartan, a Cream Cheese Pound Cake from Elkin, and a Hummingbird Cake, Cold-Oven Brown Sugar Pound Cake, and Praline Cheesecake all from Greensboro kitchens. Castle noted that the Hummingbird Cake recipe is the most requested recipe in Southern Living Magazine history. Not only will you find familiar Southern family favorites in the book, but other interesting recipes with "good stories" and quotes from the letters that came along with those recipes are also featured. Consider "Kudzu Jelly," for example, made from kudzu vines which have "delicate purple blossoms" with a "fragrance similar to grapes." The recipe submitter goes on to state, "We all low that kudzu runs rampant in the South. If you can't beat it, eat it." 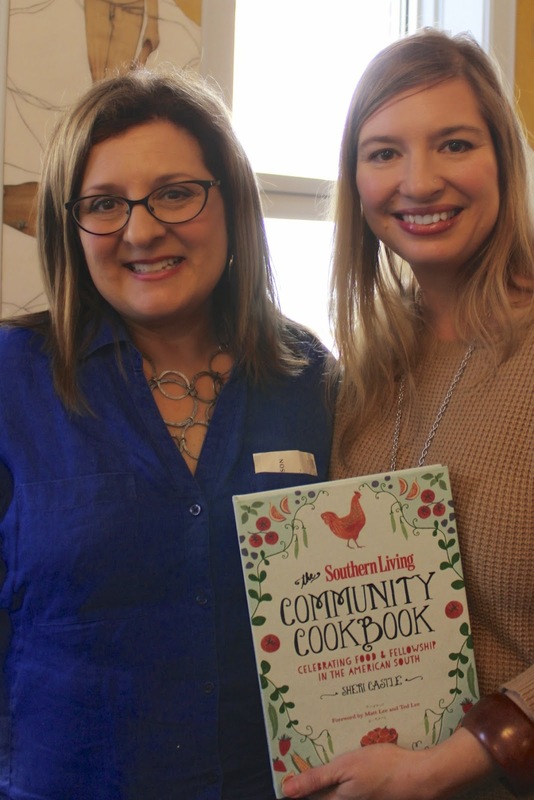 Get your signed copy of The Southern Living Community Cookbook locally at the Bookmarks office, or find unsigned copy at your local bookstore, Amazon, and Barnes & Noble. 1. Place potato in a small saucepan, cover with water to depth of 1 inch, and simmer, covered, for 15 minutes or until tender. Drain well, reserving cooking water. Force potato through a food mill or ricer into a small bowl, or max as smooth as possible with a fork. Measure out 1 cup of potatoes, and stir in 2 Tbsp, cooking water. Cover and keep warm. 2. Dissolve yeast and 1/2 tsp. sugar in warm potato water; let stand 5 minutes or until mixture bubbles. 3. Combine potatoes, remaining 1 cup sugar, shortening, 1/4 cup butter, and salt in a large mixing bowl; stir until shortening melts. Stir in yeast mixture. Cover and let rise in a warm place (80º to 85º), free from drafts, 1 1/2 hours or until spongy. 4. Stir in eggs and flour to make a soft dough. Shape dough into a ball. Place in a greased bowl, turning to grease top. Cover and let rise in a warm place (80º to 85º), free from drafts, 2 hours or until doubled in bulk. 6. Preheat oven to 375º. Deeply dimple surface of dough with your thumb or the end of a wooden spoon. Tuck buts of butter into the dimples. Stir together brown sugar and cinnamon in a small bowl sprinkle evenly over dough and down into dimples. 7. Bake at 375º in center of oven for 20 minutes or until browned and cooked through. Let cool 5 minutes before serving. It didn't take much thought to decide to sign my young son up for our local Cub Scout troop. My husband and his brother grew up in an active troop in rural Virginia, sticking with it through childhood and adolescence to eventually become Eagle Scouts. After college, my husband even went back to become a camp counselor for a summer at Raven Knob Scout Reservation, a regional camp for Boy Scouts in the mountains of North Carolina, where he taught canoeing, spelunking (caving) and rappelling to hundreds of boys attending from throughout the South. 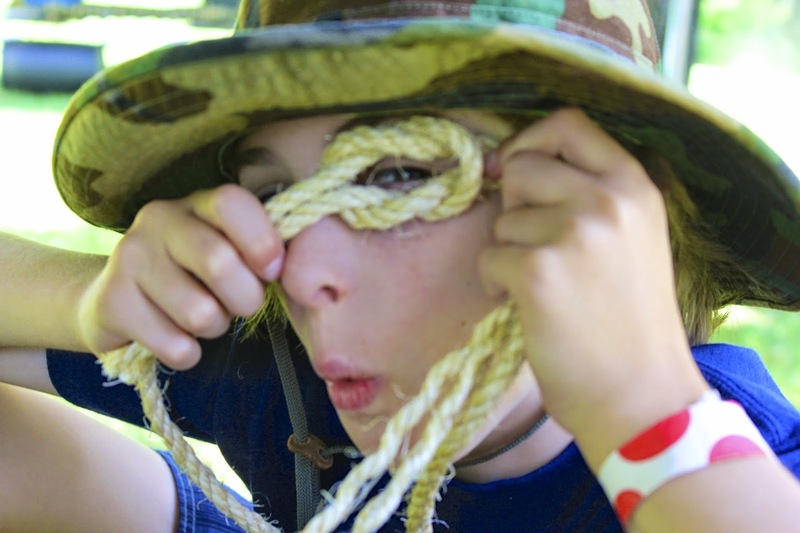 We were fully aware of the many benefits of Scouting from experience, as it helps build character and strengthen values having fun and adventures along the way. But it’s not just about tradition and familiarity. The values my husband learned in scouting are ones we want to teach our son as well. The ideals of personal responsibility, independence, character growth, good citizenship, teamwork, service to others and self-confidence are lessons and traits beneficial to all boys. By learning personal responsibility with an emphasis on serving others, they are better prepared to make good decisions, avoid peer pressure and become a leader among their peers. Our son was a little skeptical at first, but as he worked towards milestones in Pack 910, based at St. Paul’s Episcopal Church, learning various skills and taking part in a broad array of activities, he grew in self-confidence and developed more of an interest in activities we would not have necessarily attempted were it not for Scouting. 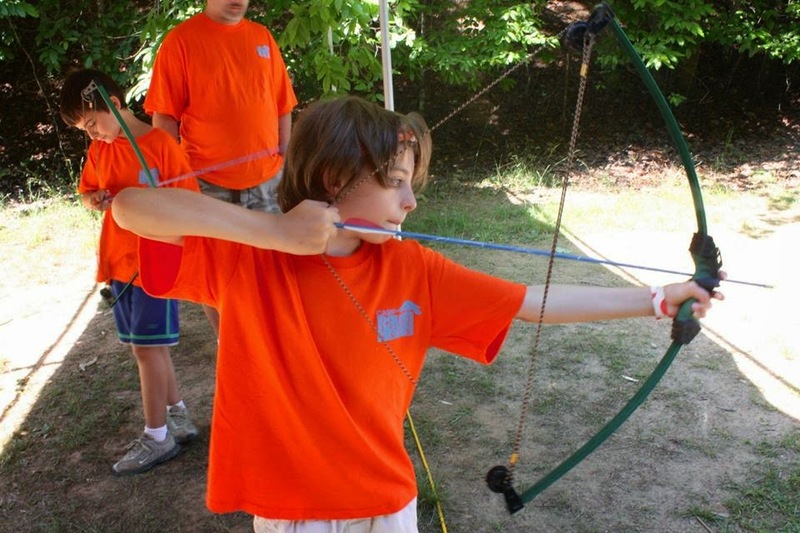 By learning skills such as archery, slingshotting (slingshooting? ), and even chess, his self-confidence has grown. My son is motivated by the goal-setting format, working towards and earning badges. He also enjoys the recognition he receives at meetings for his accomplishments. This teaches him that hard work pays off while he is learning new things, making friends and developing new interests. In this digital era where many kids are addicted to their screen-time, whether video games, television or computer, and other sedentary activities, Scouting offers diverse outdoor and physical activities with friends and caring role models in a safe environment. From hiking, biking, archery and camping outdoors, to star gazing, camp outs at the zoo, and other events to appreciate and develop skills in nature, scouting brings much-needed balance, physical activity and fresh air to an otherwise sedentary and sterile childhood. As a mother, I appreciate the safety instruction my son gains through Scouting. First aid and swimming safety are among many valuable lessons he has learned. One of their first goals included a discussion about strangers. Though we had taught our children not to go anywhere with a stranger, the points outlined in the guidebook sparked topics that we had not touched on, certainly not with any depth, and it was an important conversation that needed to be had. Pocketknife safety was another topic he learned early on at camp. 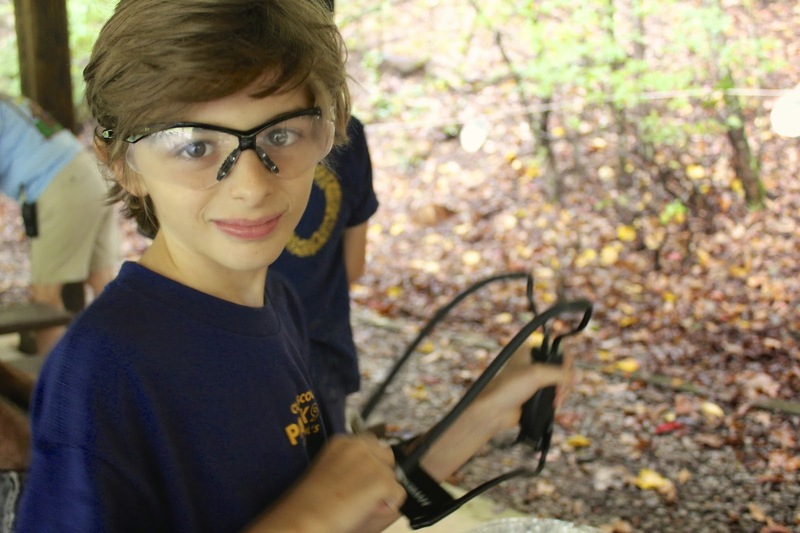 While most little boys revel at the opportunity to handle a knife and try his hand at whittling, Pocketknives are not whipped out willy-nilly in Scouting. How to open, close and hand off a pocketknife safely was taught with emphasis. The importance of the concept of the “blood circle” is invaluable – As far as a Scout can reach with his pocketknife in a 360º circle is his “blood circle” and no one should enter that blood circle while the pocketknife is open. If a Scout fails to uphold these practices while using a pocketknife, he can eventually lose the privilege of using one at scouting events for a time. These are guidelines we now use at home both with pocketknives and also kitchen knives. While parents are encouraged to lead and participate in their local troops, Scouting is also important for boys who may not have both parents involved in their lives regularly. Real caring fathers and mothers lead our Scouts, providing them with strong positive role models to lead them and teach them strong values and good citizenship, which some young boys desperately need more of in their lives. For more information about Scouts in the Piedmont of North Carolina, contact Fred Patterson at 336-760-2900 or fred.patterson@scouting.org. Find more info at www.oldhickorycouncil.org. With these cooler temps my crockpot is calling. Whether you call it a crockpot or a slow cooker, it's a miracle machine I couldn't live without. When I visit the farmers market, I sometimes buy way more produce than I can possibly eat before it starts to go bad. This is a great dish for clearing out the fridge. I lovingly refer to it as "Curry Kitchen Sink Stew." Carrots or yellow potatoes could be added or substituted for the sweet potatoes and the kale could be switched out for spinach or even rainbow chard. Experiment and consider omitting or adding veggies you think might work with these flavors. It's a Meatless Monday staple, vegan, gluten free and dairy free. Another great thing about this recipe is that it makes plenty! It's a great dish for a potluck or for freezing half for later. Cut it in half if you'd like less. 1. Add the vegetable stock, pumpkin puree, curry, brown sugar, ground ginger and garlic to the crockpot and stir. 2. In a skillet, heat the oil and sauté the onion with the sea salt until translucent. Pour into the crockpot. 5. Cook on High for approximately 4 hours, adding stock as needed. 6. Remove the ribs from the kale and tear into large pieces. Add the kale to the crockpot. Stir to incorporate. Once the kale has wilted, taste and add spices if needed. Serve alone, over quinoa, basmati rice, couscous or orzo pasta. Note: I haven't had trouble freezing this, but some say to omit the coconut milk when freezing and add it instead when you warm it up because it may separate. As a native of Mount Airy, North Carolina, better known to some as "Mayberry," I grew up eating strawberry or sweet potato sonker often for dessert. "Sonker" is a cousin of the cobbler that I later learned is also native to Surry County. It's a wonderful comfort food and potluck staple. Exactly what constitutes a cobbler depends on where you grew up. To me, a cobbler is fruit baked with a pie crust top, though not in a pie pan. So no, I don't think a sonker is another name for a cobbler, but then my sonker recipe below may look exactly like what you'd call a cobbler. The New York Times had an article about the topic last year: "Sonkers, Grunts, Slumps and Crumbles." I love Alma Venable's quote in the article, "You have the violin and you have the fiddle. The sonker is the fiddle." And Our State magazine featured the dessert recently as well in "A Foothills Twist on Pie: The Sonker." If you're local, it's worth a visit to the Sonker Festival, held annually on the first Saturday in October in Lowgap, NC. No admission, just a small charge for sonker by the cup. They serve up all kinds - strawberry, blueberry, blackberry, cherry, sweet potato and more, all to the twang of old-fashioned bluegrass music. 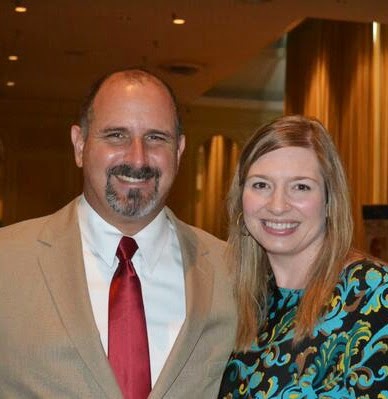 Proceeds benefit the Franklin-Edwards house restoration project, at which the event is held. My family made mostly strawberry and sweet potato sonkers and never made the "sweet dip" to go along side, though my husband's family prefers blackberry sonker and would never skip the sweet dip. Though many use the traditional "cuppa cuppa cuppa" recipe, referring to equal parts self-rising flour, milk, sugar, butter and fruit, my family always preferred the recipe below. I'm also including my gluten free, dairy free "cheat" version (for my family with allergies). 3. In a cast iron pan or saucepan, stew fruit and 1/4 cup of the sugar sprinkled on top just until bubbling to get the juices flowing. 4. Mix flour, the rest of the sugar, vanilla and milk in mixing bowl and pour into baking dish (some prefer to wait and pour over once fruit is in the dish). 6. Bake for 45 minutes or until top is golden and juices are bubbling. 1. Place peaches into 9x13 or other deep baking dish. (I prefer to cut mine into bite-size pieces for ease and to create more juice.) Drizzle honey on top of the fruit. 2. In a mixing bowl, very gently stir the dry cake mix with butter, vanilla and the seltzer water. (The seltzer water helps the batter rise.) Stir gently just until wet. Do not use a mixer. 3. Pour batter over the top of the fruit and fold in the fruit. Sprinkle cinnamon on top. 4. Bake 45 minutes or until golden brown and bubbly. It has been a wonderful couple of months for foodies and particularly Southern foodies here in Winston-Salem, North Carolina. Just a few days ago, we met and watched the first TV Queen of Southern cooking, Nathalie Dupree, make biscuits and shrimp and grits. This week, we'll be honored to see another Food Network star, Pat Neely, of the show "Down Home with the Neelys." This foodie town keeps growing! Don't miss these opportunities to learn from and meet the best! 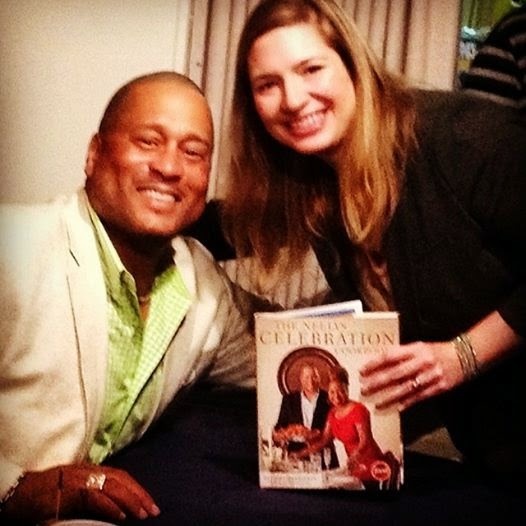 My post-event photo with Pat Neely! 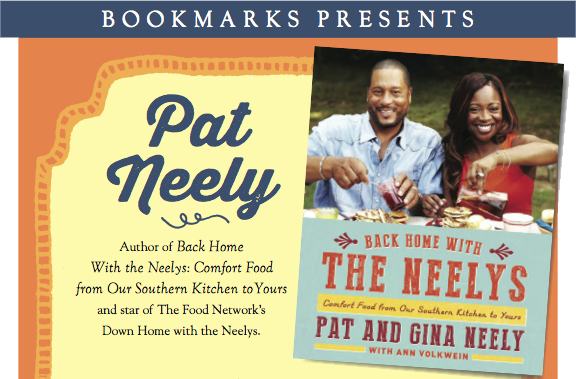 I'm very excited to be attending a meet and greet with celebrity chef Pat Neely the evening of June 4th at 7 p.m. Pat will be at the Arts Council Theatre talking about his latest cookbook Back Home with the Neelys: Comfort Food from our Southern Kitchen to Yours, co-authored by him and his wife, Gina. Shannon Smith of Fox 8 will talk with Pat about his life, his cooking, his television show and his love of barbecue. Pat will sign cookbooks following the conversation, and there will be a reception featuring some of the dessert recipes from the Neely's cookbook. Tickets for the conversation with Pat Neely are $15 for general admission and $35 for a ticket and a copy of the cookbook. The event is sponsored by Bookmarks Book Festival. The next morning, June 6th, at 8 a.m., Pat Neely will appear at one of my favorite downtown restaurants, Sweet Potatoes, for an "Eat & Greet." 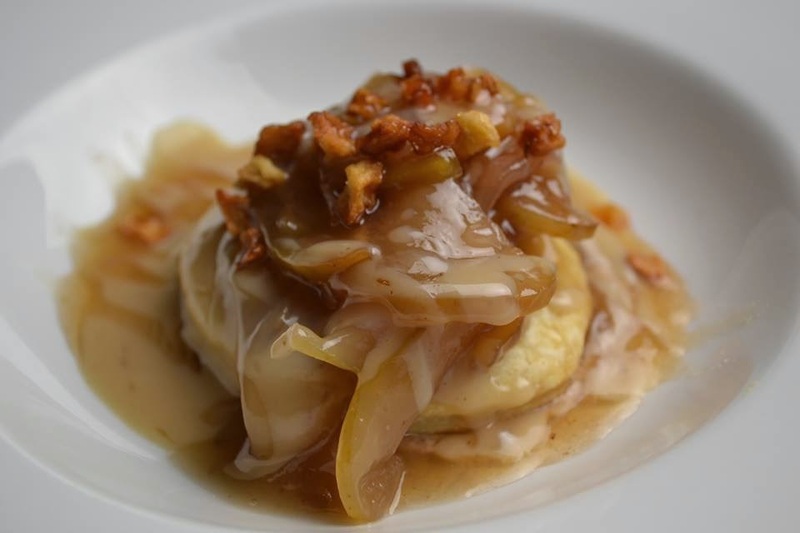 The event includes a full breakfast of friend catfish, pecan flapjacks, apple smoked bacon, sausage cream gravy with sweet potato biscuits, cheese grits, peach almond crisp and more, all based on the Neely's recipes and prepared by Sweet Potatoes' chefs. During the meal, Pat will discuss the cookbook, his life and his Food Network show. Tickets for the eat and great are $52 and include the full breakfast and a copy of the cookbook, Back Home with the Neelys. 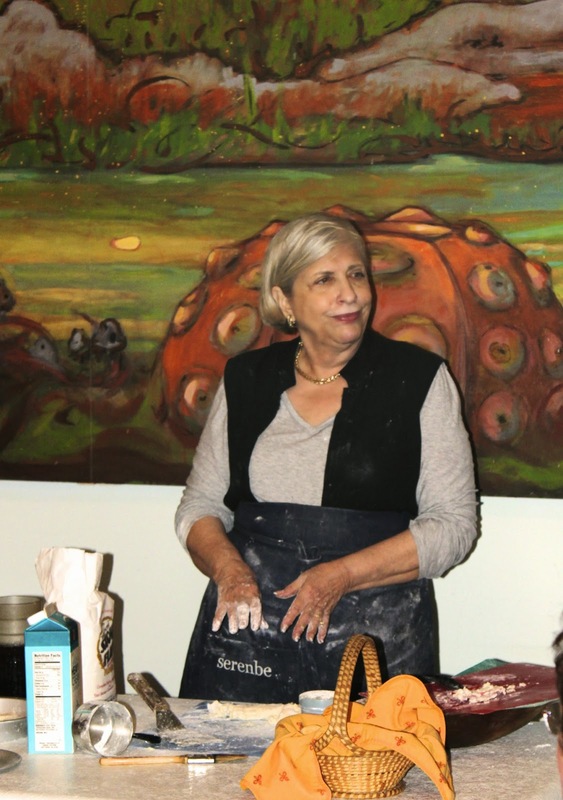 Celebrity Chef Nathalie Dupree Visits Winston-Salem! The event features fun interactive LIVE chef demonstration by local celebrity chefs in their own right, Chef Jeff Bacon of Triad Community Kitchen and Tim Grandinetti of Spring House Restaurant, Kitchen and Bar, followed by Chef Nathalie Dupree, who will explore some classic Southern recipes with a new twist. 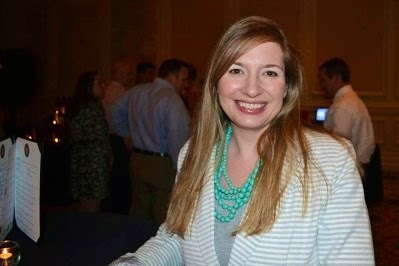 Nathalie will feature two dishes that incorporate local southern food and progresses step-by-step so that the audience can follow along and ask questions. Michael Hastings, Food Editor of the Winston-Salem Journal will be the Master of Ceremonies and will talk us through the chef demonstrations. 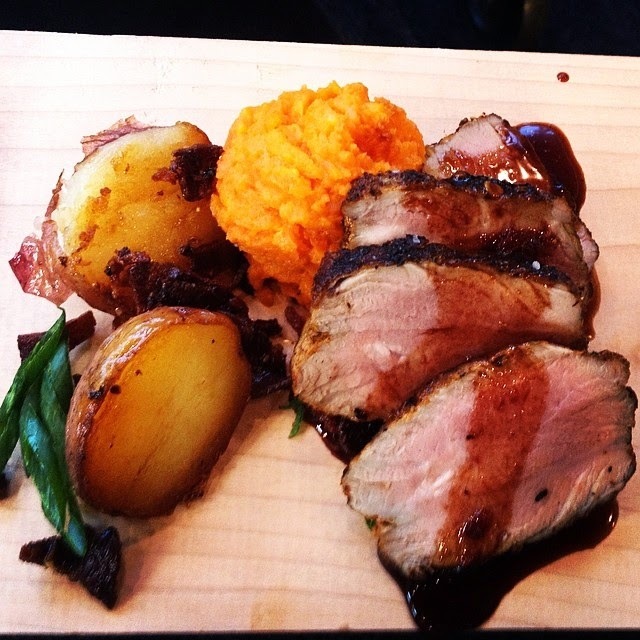 As a teaser for the event, they've released the dazzling menu being prepared for Chef Tim Grandinetti's food demonstration: Pan Roasted North Carolina Pork with Coffee, Chocolate, Cinnamon and Texas Pete Chipotle Chile Glaze Duck Fat Roasted Potates! A few lucky members of the audience will get to join the chefs onstage for a sneak a taste. Don't worry, they haven't forgotten that this event is part of Salute! Wine Festival! Guests will enjoy some fine North Carolina wine, as well as small bites, and get to enjoy a custom ice sculpture for the event by Fire & Ice! Attendees will go home with the recipes demonstrated. 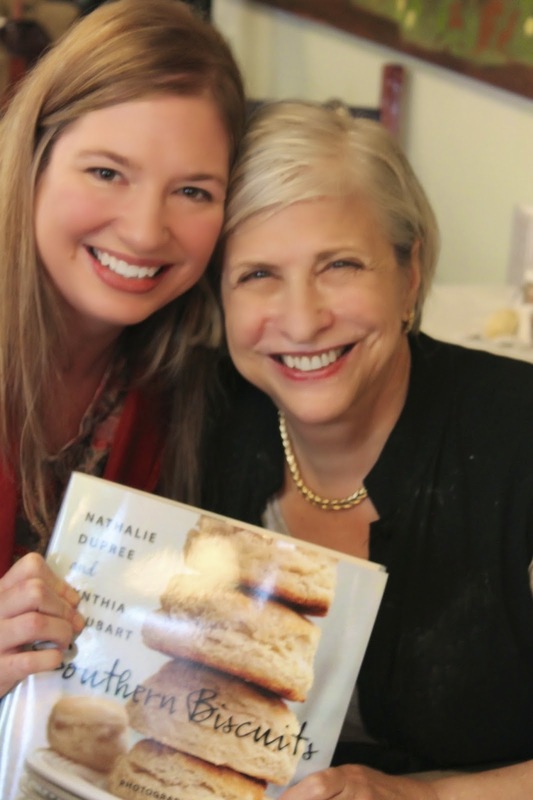 South Carolinian Nathalie Dupree is a best-selling author with 15 cookbooks and more than 300 television shows for The Food Network, PBS, and The Learning Channel. The Founding Chairman of the Charleston Food and Wine Festival, she also was a founder of Southern Foodways, the Atlanta and Charleston Chapters of Les Dames d' Escoffier, the American Institute of Wine and Food and the International Association of Culinary Professionals, of which she was two-time President. But don't let all those credentials intimidate you. I was thrilled to attend a wonderful biscuit-making demonstration by Dupree held at the local treasure of a farm-to-table restaurant Mary's Gourmet Diner (pictured here). Nathalie is both down-to-earth and funny while she delivers great cooking instruction and general good advice. My biscuits have never been better! There will also be a chance to get your favorite Nathalie Dupree cookbooks signed, sponsored by BookMarks Book Festival. I had her sign her cookbook Southern Biscuits for me (because, obvi, How could I not??) and another for a wedding gift. In this book not only are there recipes of many biscuit variations, but also helpful instruction on why and how: the use of different flours, biscuit and pan placement and the way your oven heats. Tickets are still available for the Salute! 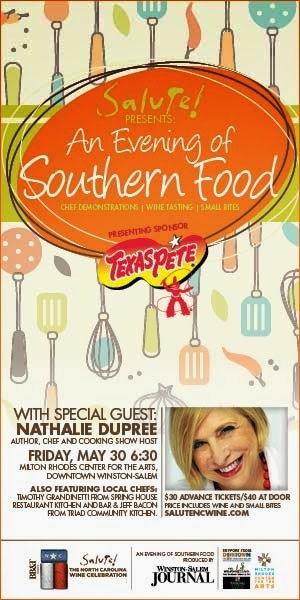 Presents: An Evening of Southern Food with Nathalie Dupree. At only $30, this is a great deal for a celebrity chef cooking demonstration including two local chefs, wine and small bites! Tickets are available online, by calling 336-727-7403 and by visiting the Winston-Salem Journal offices at 418 N. Marshall St. Note: Must by 21 or older with valid ID to attend. 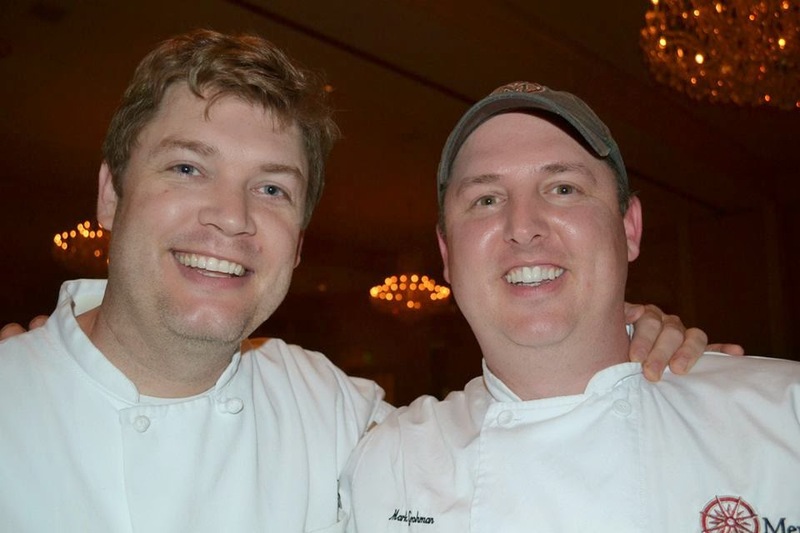 To read about the previous quarterfinal battle between Chef Kevin Grohman of Meridian Restaurant in Winston-Salem and Chef Russell of B. Christophers in Greensboro, see my earlier post here. Follow me on Twitter at @SouthrnBiscuits to view live tweets and pics of the battles. It was a privilege to once again be a judge at the Competition Dining Fire in the Triad Quarterfinal battle at the Empire Room in Greensboro last night. Contenders were Chef Timothy Grandinetti of Spring House Restaurant and Chef Kevin Reddick of Millennium Artisan Restaurant, both located in downtown Winston-Salem, NC. The Secret Ingredients: Holy Shiitake! I'm truly enjoying being able to type "Holy shiitake!" again and again and it being somewhat relevant here. I think there was a missed opportunity when naming this farm, but shiitake happens, I guess (see, still relevant). The secret local ingredients are unveiled to the chefs each competition date at noon. They prepare their menu for 100 guests without the use of cookbooks or the internet. The secret ingredients tonight were fivefold from Fogwood Food in Reidsville, NC: shiitake mushrooms, arugula, organic Smith Farms pea shoots from Stoneville, NC, Swiss chard and butter pecan syrup. Whew! That was a mouthful about to be a mouth-full. Mushrooms are a favorite of mine, so I had high hopes for the evening. What I love most about these food competitions is that people slow down and think about their food. We waft the air to deeply breathe in the aroma of each dish; spin the plate around to admire the presentation (sometimes checking the photo freshly posted to Twitter to see how ours compares), and then I deconstruct my dish to taste the flavors individually and then all together, paying close attention to the use of the secret ingredient(s) of the night, and finally, consider the creativity of the dish so we can score all appropriately. 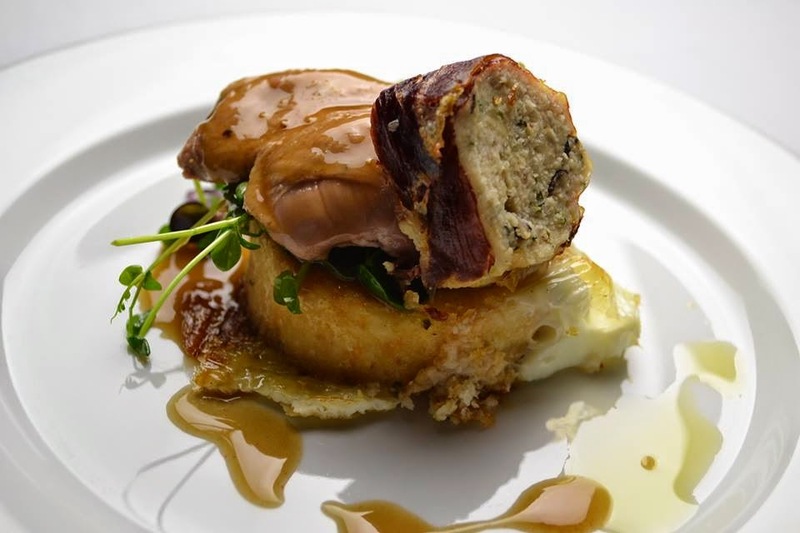 This dish had a lot going on – four protein sources in all: crab wrapped in bacon, quail and egg. The grit cake was perfect and the quail egg was also just right – a combination of softly cooked and runny. The lemon glaze was a great compliment to the pea shoots, which had a taste similar to strong alfalfa sprouts. The quail and crab were fine, but I could have done without one or the other and still would have been happy with this dish. I’m sometimes not a fan of pork belly, as I often get more belly (fat) than pork, but this Cheshire Farm pork belly was not too fatty and full of flavor. The creamy shiitake polenta was dense, but a good pairing with the pork. Although I liked the idea of the fruit salsa, it just wasn’t flavorful enough to match the strong flavors of the pork and polenta. Loved the Yukon chip which also added drama to the presentation. This dish was a favorite of our table. The duck was perfectly cooked and not greasy. The pearl couscous was a little soft, but soaked up the four-pepper ragout beautifully, which left a lingering heat on the palate, though the pepper must have overpowered the butter pecan flavor, as I couldn't find it. My mushroom caps were a little limp, but that didn’t keep me from loving this dish. This was another favorite at our table. Though many were leery of venison in general, they all decided it was better than they expected. 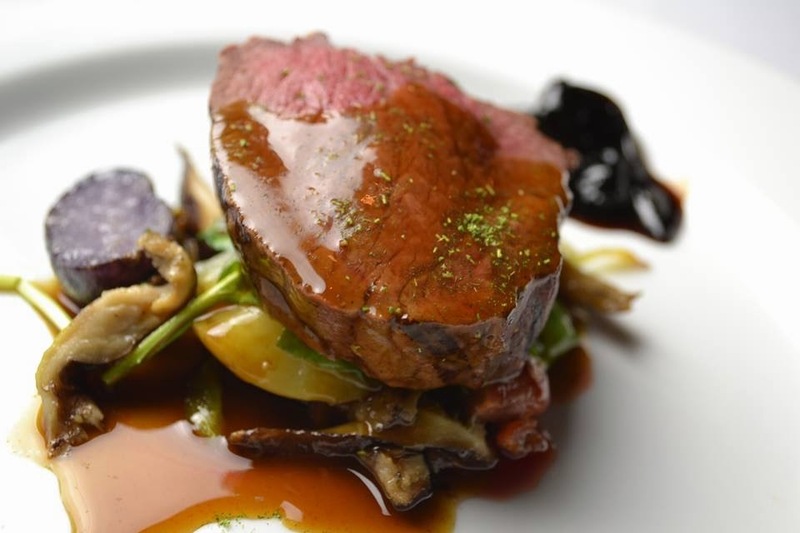 I thought my venison was a little overcooked and flavor was a little lacking, but the vegetable mélange, where our shiitake mushrooms were found was packed with flavor along with the bit of tart bing cherry jam. Although it was the lowest scoring dish of the evening, (perhaps others were put off by the venison?) all around it was a great hearty fall or winter dish. This was not surprisingly the highest scoring dish of the evening (did you read that description?? Hello Miss American Pie). 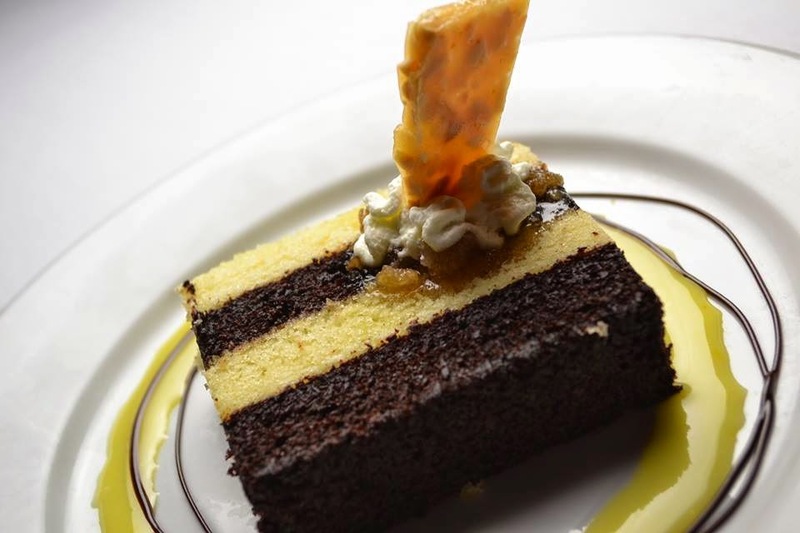 As our host Jimmy Crippen always says, these battles are often won and lost with the desserts. The pâte brisée (a.k.a., pie crust, shortcrust pastry) was a mouthful of sweet apple pie comfort food with creamy butter pecan and I finally found the cinnamon crème fraîche on the underneath it all (more please!). The cake, while it was was very pretty and moist and the orange drizzle was gave a light fresh citrusy flavor, there was nothing that stood out about it. The pecan brittle didn’t seem to belong, and since it was supposed to be the highlighted secret ingredient in this dish, felt more like an afterthought. The scores of the “pros” and the “joes” were tallied and Chef Tim Grandinetti of Spring House Restaurant won by seven tenths of a point! “That was too close,” said our self-proclaimed competitive victor. But he came in with a plan and felt that the plan made the difference. Kudos to Chef Grandinetti and his all-woman team! You can be the judge, too! 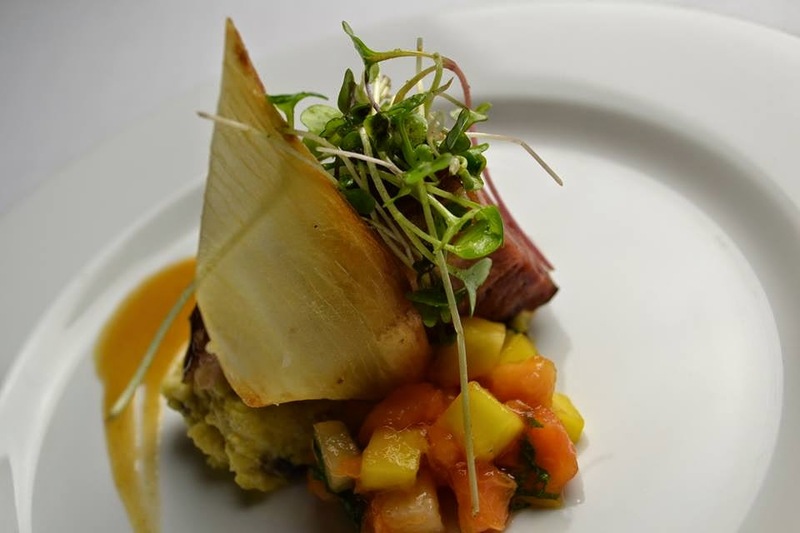 Attend Competition Dining and you and vote your palate at an upcoming Fire in the Triad or other Competition Dining event across the state of North Carolina, all highlighting our North Carolina produce and artisan foods. Got to be NC! For tickets and more information, visit competitiondining.com. Moi, excited about the evening. 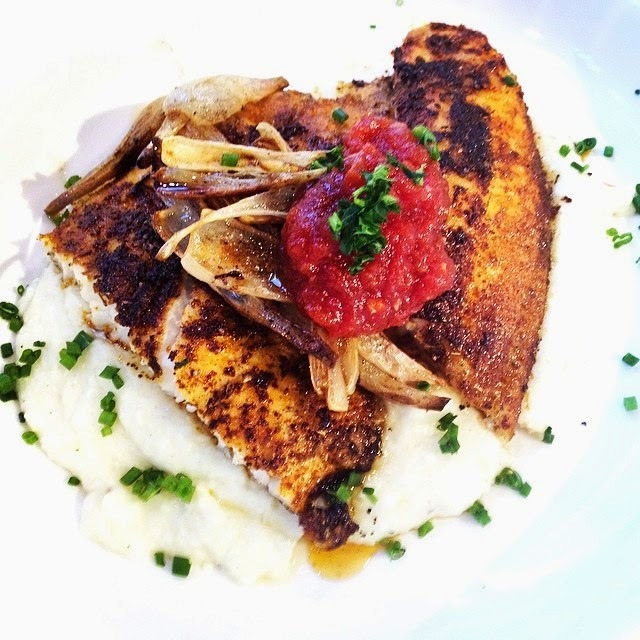 Photo credits: Kristi Maier of Competition Dining. Last night I was excited to once again be a judge and special guest at Competition Dining Fire in the Triad! 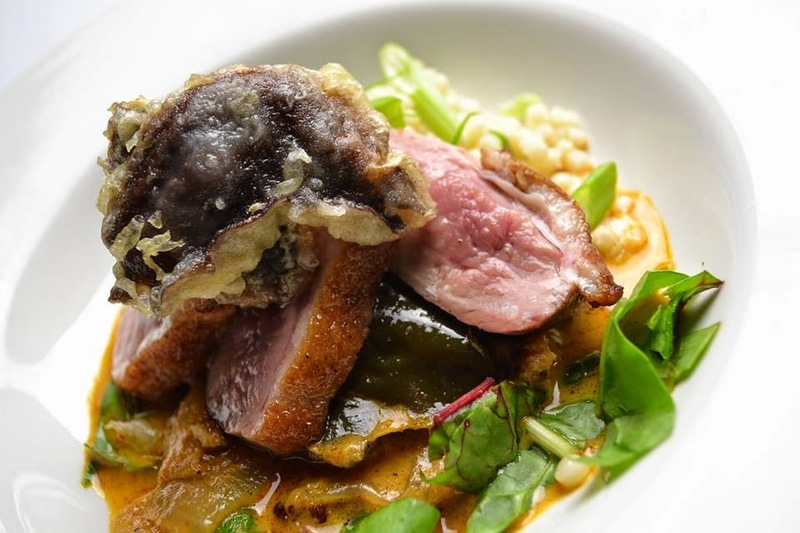 This was no ordinary Fire in the Triad battle, but the quarterfinal battle between Chef Mark Grohman and team of Meridian Restaurant in Winston-Salem and Chef Chris Russell of B. Christophers restaurant in Greensboro (formerly of Burlington), NC. MeridianRestaurant is a local favorite here in Winston-Salem, for good reason. Though I haven’t had a chance to visit B. Christophers restaurant in Greensboro yet, the samplings I’ve had by Chef Chris Russell at Fire in the Triad battles are great incentive to put it on the top of my list to visit next time I’m in Greensboro. One treat at these events is hearing the chefs' backstory. Most all of the North Carolina foods for Competition Dining are provided by Southern Foods. The secret ingredient for this battle was (drumroll….) High Rock Farm chestnut flour. High Rock Farm is located in Gibsonville, NC. (Sending out some local gluten free foodie love!) As one with family members with gluten allergies, I for one, was thrilled about the secret ingredient. However, neither chef seemed too thrilled about the chestnut flour challenge, as it was the first time for both using the flour, but they both stepped up for delicious and creative results in this “Iron Chef”-style competition. I'm happy for the local gluten free find and will try it out myself soon! During the cocktail hour, I sampled Hummingbird Helles by Red Oak, a golden lager that like all of their draughts, is fresh and cold-aged, not filtered or pasteurized. Plus, I scored some awesome Red Oak swag – a Red Oak/Hummingbird pint glass and hefty pewter bottle opener! Another first taste was wines from Jones von Drehle, a new winery in Thurmond, NC. Another to put on the must-visit list! Representative Diana Jones was in attendance to talk about their wines. Now, on to the main reason we’re all here – Gourmet NC food! 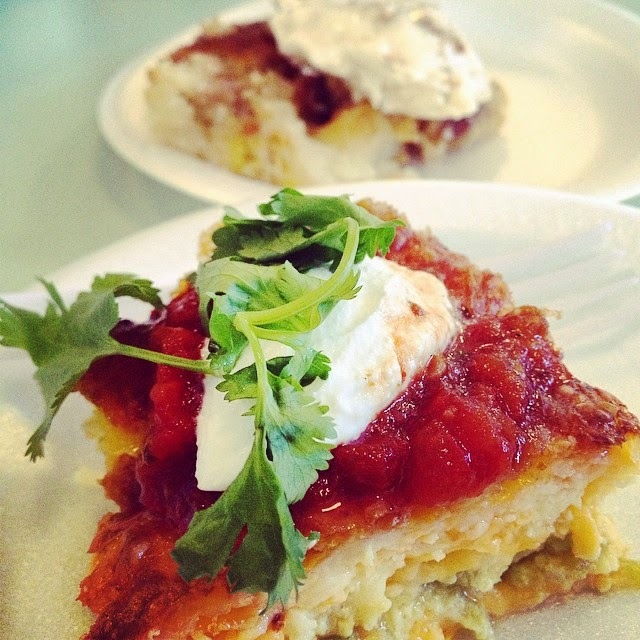 This savory Southern dish was a big hit at our table. 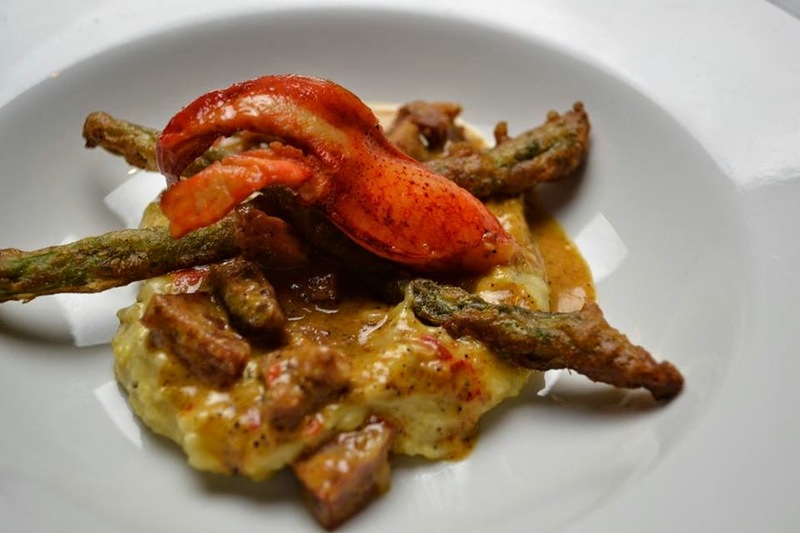 You’ve never had cheese grits like this, but the chestnut flour made them a welcome and hearty compliment to the spicy Andouille sausage and the chestnut flour-coated asparagus tempura was a delicious surprise. The “pyramid” dumpling was a creative use of the chestnut flour, though tougher than your usual flour pasta, it had great flavor. 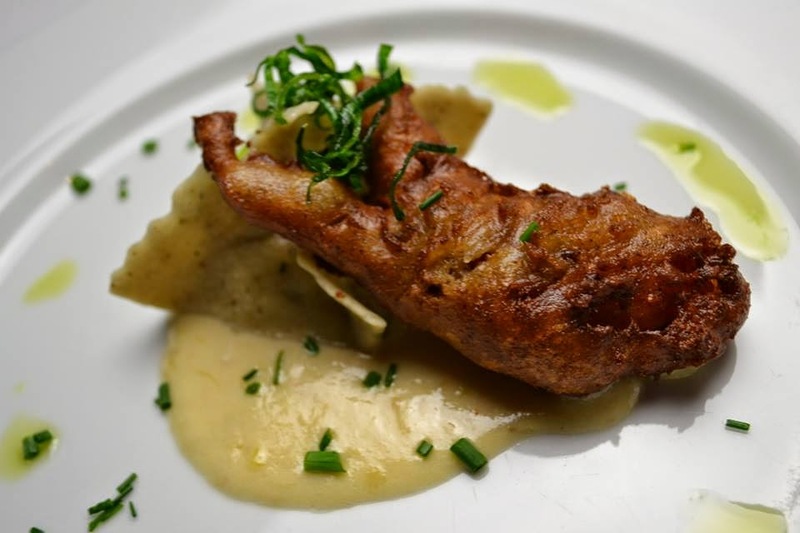 But the use of the chestnut flour in the Red Oak beer batter for the lobster claw was a favorite, and no one was complaining about a second course of lobster! Presentation was lacking in this dish (none at our table looked this good), and I think the scores showed this, but the delicious savory-sweet jerk pulled pork made up for it. Although the description of the corn fritter sounded great, it was a little disappointing. 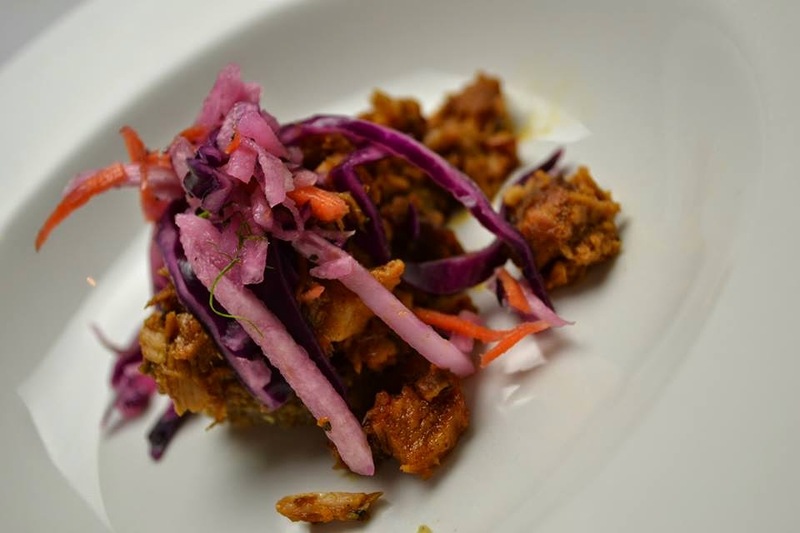 The red cabbage slaw added nice color and crunch. Schlemiel, Schlimazel, Spaetzle & Venison Incorporated! What is spaetzle? Folks at my table wondered, even after tasting it. Literally, “spaetzle” means “little sparrow,” but culinarily, it is a type of egg noodle or dumpling found in German, Austrian, Hungarian and Swiss cuisine. The chestnut flour spaetzle was a nice, (to risk repeating myself --) hearty, though chewy, compliment to the beautifully presented venison and roasted carrots, though the venison was the star of this dish. My venison was quite rare, while another tablemate’s was quite well-done. Still, his dish was a favorite at my table, myself included. The red wine coriander reduction was a saucy cherry-on-top. 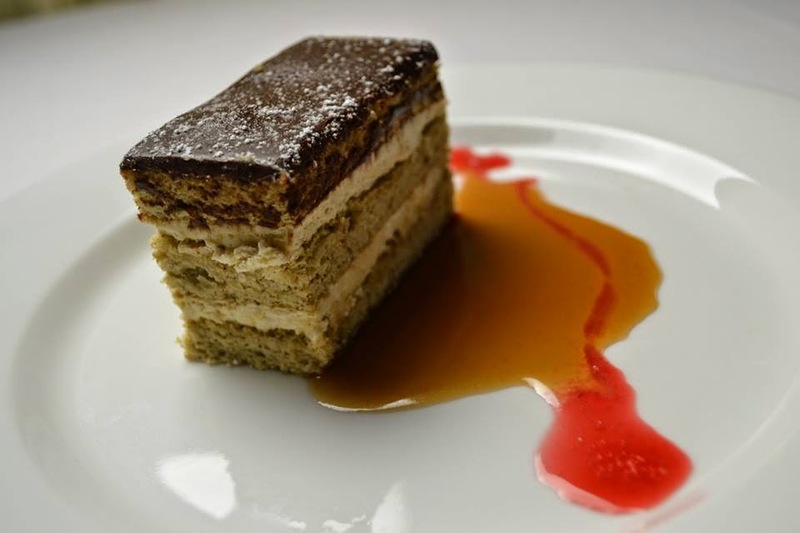 This dessert was like an upscale ice cream sandwich, complete with fresh minty ice cream between two slices of thin, firm, chestnut flour cake. Everyone was impressed and I thought it would be hard to beat… until it was, in my opinion. Though this dessert ranked the highest score between the two. Let’s talk nut cake. I was very impressed with the chestnut flour opera cake. I’ve made and had lots of cake made with gluten free flours, mostly almond. So, I’m very aware and accept that any cake made with nut flour is going to be denser, grainier and dryer, rather than the fluffy processed wheat flour versions to which we’re accustomed. Perhaps this is why I was more impressed than other guests at the great job Chef Mark Grohman making this cake as fluffy as he did, and preventing the dryness that usually comes with a nut flour cake with the layers of coffee butter cream. The bourbon caramel was so good we discussed bottling it at my table and the only bad thing about the Cheerwine coulis was that we wished there was more. (I confess, I “sopped” my sauces up with my cake, a practice I usually strictly reserve for my biscuits alone.) Both desserts were wonderful, but I was surprised this one didn’t score higher. But this time, Chef Grohman and his crew from Meridian Restaurant still achieved sweet success and prevailed despite their dessert score. 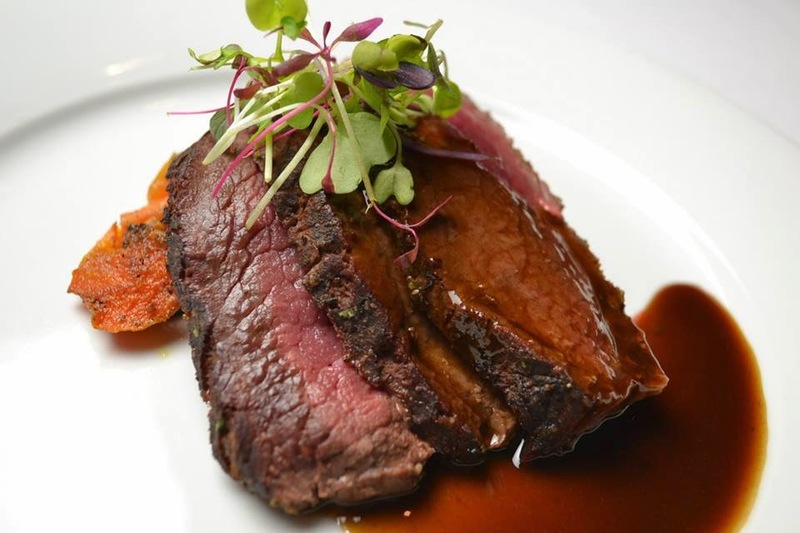 Congratulations to Chef Mark Grohman and Meridian on your delicious win! I look forward to judging next week’s quarterfinal battle between Winston-Salem beloved restaurants Spring House Restaurant and Artisan, two I haven’t tasted the pleasure of competing since Battle Dish in Back in February!